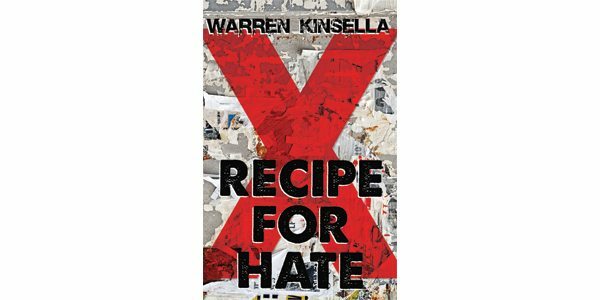 While Recipe for Hate is the first young adult novel from Toronto polymath Warren Kinsella (whose resumé includes lawyer, writer, musician, consultant, and commentator), it reads like a culmination of certain aspects of his life and work. The novel draws together Kinsella’s experience as a punk in the late 1970s (the subject of his 2005 book, Fury’s Hour) and his research into the organized racism of the far right (contained in his bestselling Web of Hate) to create a resonant novel of teen punks in crisis in the winter of 1978–79. At the centre of the novel is the X Gang, a loose collective of disaffected youth who orbit around X, an oddly low-key yet charismatic schoolmate, whose editing of a controversial zine is the most visible aspect of his importance to the group. His best friend, Blank, narrates the novel (from some undetermined point in the future), chronicling the events that take place after one of the gang is murdered behind the seedy biker bar where they hang out. In the face of bureaucratic failure and social ostracism (both of which increase when other attacks follow), X, Blank, and the other members of the group begin to investigate the violence themselves, stumbling across growing racism in the skinhead community, fuelled by tenets of Christian Identity and the Aryan Nation. Kinsella skilfully blends convincing depictions of both the punk scene and the racist underground with the hoary trope of a band of kids setting out to solve a mystery. The novel is a suspenseful page-turner that also gives considerable food for thought, anchored in realistically drawn characters and an eye for significant detail. While it’s definitely a period piece (it’s only a shade too soon to refer to a novel set in the 1970s as “historical”), its significance to contemporary life and social schisms is powerful, and impossible to ignore. The days of punk might seem like a quaint anachronism now, subverted by commerce and marketing, but Kinsella captures the political underpinnings of the movement – a surprising reminder of hope in these dark days.